Entrance unit veneered in ash or in fiberboard. 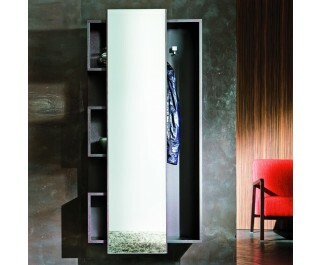 Sliding mirror with aluminium mechanism. You can choose the position of the cubes (left or right). Available finishings: WG wengé, NC walnut, TB tobacco, open pore matt lacquered ( L21 white, L29 pearl, L23 cappuccino colour, L25 smoke grey, L22 black, L24 red ), closed pore matt lacquered ( L1 white, L19 pearl, L3 cappuccino colour, L5 smoke grey, L2 black, L4 red, L40 microembossed beige, L41 microembossed ecrù, L42 microembossed mud ).